Why do we call this sauce a power pesto? Because it is packed with many nutrients beneficial to our body. 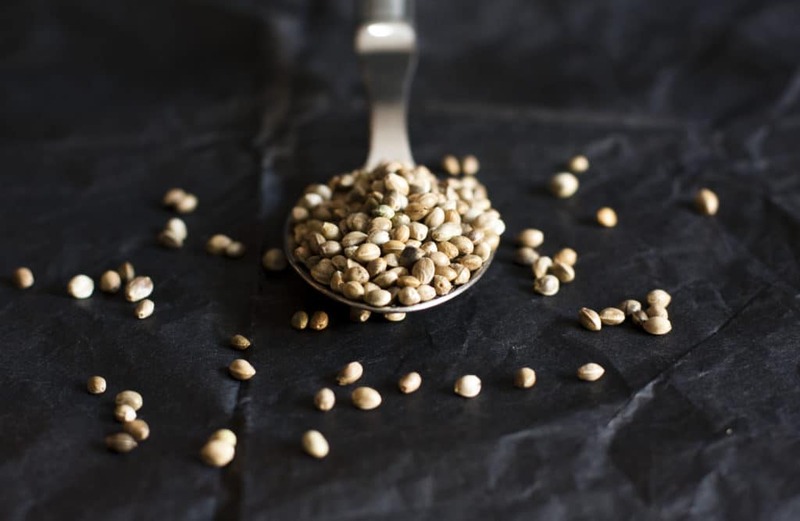 Hemp seeds contain high levels of poly-unsaturated fatty acids, (PUFA) including Omega 6 and Omega 3 in a ratio between 2:1 and 3:1 (this is important for absorption). PUFAs are called essential fatty acids, as our organism is not able to produce them on its own and it depends on their absorption from food. They are rich in water-soluble fibers (called mucilage) that form a gel after soaking in water. These fibers slow down stomach emptying and hence give more time to the intestine to absorb nutrients. This herb is not only a tasty and beautiful herb to add to dishes, it also contains many antioxidants including volatile oils and flavonoids. Among these oils, mystricin is known to activate an enzyme (glutathione-S-transferase) that allows glutathione to attach to oxidized molecules. This process inactivates oxidized molecules, also known as radicals. Among the many benefits of garlic, we find increased absorption of iron and antibacterial and antiviral activity. Garlic contains diallyl sulphides, compounds that increase the production of ferroportin, a membrane protein that allows stored iron to exit the cell and circulate into the system. To make this pesto you can either use pestle and mortar or a blender. If using a blender, make sure that you do not overheat the parsley and the oil, as heat makes basil taste bitter and it also changes the structure of some fats present in olive oil. Simply mix the above ingredients together until you reach a consistency that you like. You can serve the pesto immediately on pasta (or cucumber noodles if you have a spiralizer), or store it for up to 4 weeks in the fridge. If you are planning to store it for long, make sure you add some extra olive oil so that it doesn’t dry up. If you enjoyed this recipe, and would love to introduce more plant-based dishes onto your feasting table these days, why not checking our VEGAN FESTIVE COOKBOOK? It’s a free donation ebook with plenty of festive recipes that will bring health & peace to your plate (and also a great way to support all of our FREE articles throughout this past year!). Callaway, J. C. 2004. Hempseed as a nutritional resource: An overview. Euphytica. 140: pp. 65-72. Cicerale, S. Lucas, L. and Keast, R. 2010. Biological Activities of Phenolic Compounds Present in Virgin Olive Oil. International Journal of Molecular Sciences. 11(2): pp. 458-479. De la Lastra Romero, C. A. and Gonzalez, G. 2011. An up-date of olive oil and bioactive constituents in health: molecular mechanisms and clinical bioactive constituents in health: molecular mechanisms and clinical implications. Current Pharmaceutical Design. 17(8): pp. 752-753. Wood, R. 1988. The Whole Foods Encyclopaedia. New York: Prentice-Hall Press. Gautam, S. Platel, K. and Srinivasan, K. 2010. Higher bioaccessibility of iron and zinc from food grains in the presence of garlic and onion. Journal of Agricultural and Food Chemistry. 58(14): pp. 8426-8429. Ghalambor, A. and Pipelzadeh, M. H. 2009. Clinical Study on the efficacy of orally administered crushed fresh garlic in controlling Pseudomonas aeruginosa infection in burn patients with varying burn degrees. Jundishapur Journal of Microbiology. 2(1): pp. 7-13. Landete, J. M. 2012. Plant and mammalian lignans: a review of source, intake, metabolism, intestinal bacterial and health. Food Research International. 46(1): pp. 410-424. Previous story Biodiesel explained: what is it?